Drawing on citation data that spans disciplines and time periods, Elliott Green has identified the most cited publications in the social sciences. Here he shares his findings on the 25 most cited books as well as the top ten journal articles. The sheer number of citations for these top cited publications is worth noting as is the fact that no one discipline dominates over the others in the top 20, with the top six books all from different disciplines. There has been an increasing focus on citations as a measure of academic productivity in recent years, in part due to the increased ease of access to data from Google Scholar since it was launched in 2004. While there has thus been a large amount of interest in how scholars can obtain higher numbers of citations, there has been comparatively little attention to examining what publications actually obtain huge citation counts. There has been one study from Nature in 2014 of the top 100 most cited publications using data from Google Scholar, which included papers across all academic disciplines. 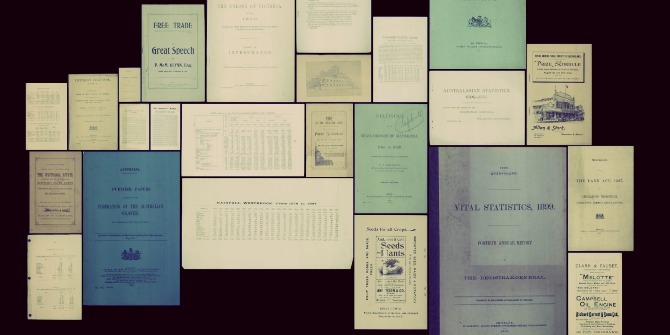 Due to higher citation counts in the natural sciences, the list thus included very few publications from the social sciences (with only one spot in the top ten), of which a large number were actually methodology textbooks. As such it is worth constructing a similar list, but just for the social sciences. I used Google Scholar to create a list of all publications which drew more than 20,000 citations, which I sub-divided into books and journal articles due to the fact that some disciplines tend to publish more in one format than the other, as well as methodology publications (including econometrics and statistics as well as qualitative methodology) due to the fact that methodology publications tend to be cited as if they were textbooks and can thus attract much higher citation counts than other publications. 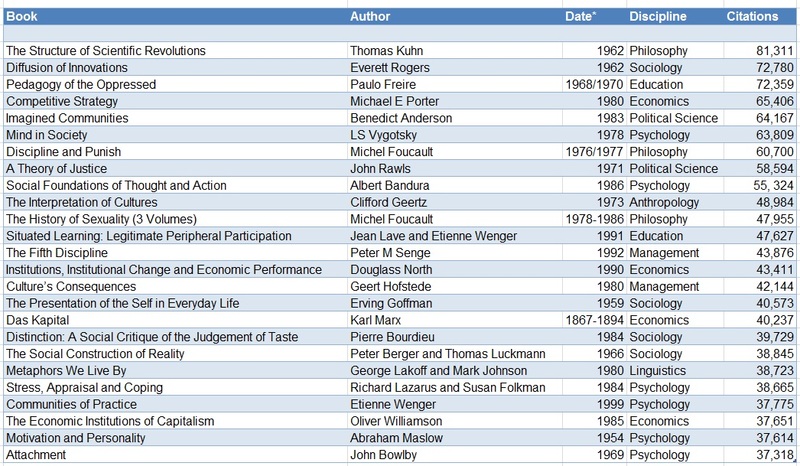 I begin with the list of the top 25 most published books in Table 1. Several things are immediately apparent. 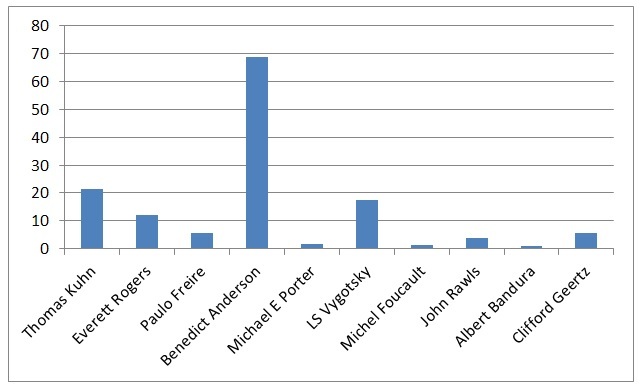 First is the sheer number of citations for the most-cited books: the most cited book, Thomas Kuhn’s book The Structure of Scientific Revolutions, has more citations that the entire body of work of such noted social scientists as John Stuart Mill (74,807 citations), Daniel Dennett (67,625), Avinash Dixit (61,112) or Steven Pinker (58,574). Secondly, no one discipline dominates over the others in the top 20, with the top six books all from different disciplines. 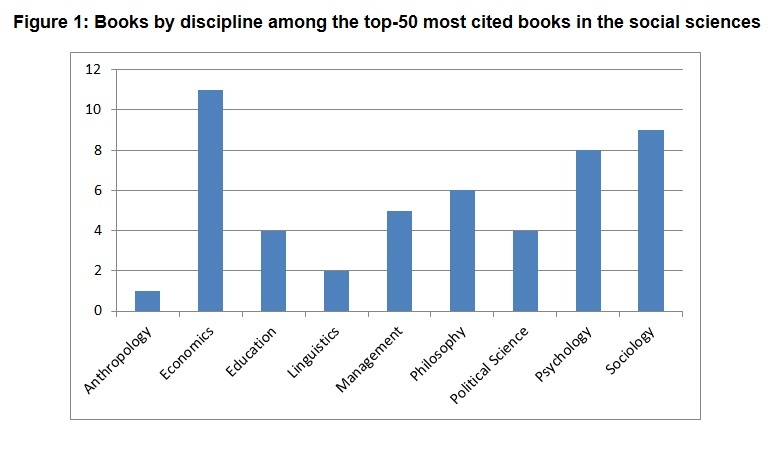 However, if we expand our analysis to the top 50 books, as seen in Figure 1, economics dominates over other disciplines, followed by sociology and psychology. In contrast geography is totally absent from the list, with its highest-cited book, David Harvey’s The Condition of Postmodernity (1989), coming in at 65th on the list, and no other book in anthropology has more than 20,000 citations other than Clifford Geertz’s The Interpretation of Cultures (1973). * Single-volume books originally published in a foreign language are listed twice, with the English-language edition listed second. Third, there is a distinct inverted-U shape curve to the date of publication, with books published between 1960 and the early 1990s dominating over both older and newer books. In Figure 2 I plot the distribution of date of publication by decade for books in the top 50, which shows that the 1980s and 1990s dominate over other decades. The only books in the top 50 published within the last 20 years are Robert Putnam’s Bowling Alone (2001), Amartya Sen’s Development as Freedom (1999) and Etienne Wenger’s Communities of Practice (1999); on the other end the only two books published more than a century ago are Adam Smith’s The Wealth of Nations (1776) and Karl Marx’s Das Kapital (published initially in German between 1867 and 1894). Indeed, given the strong trend towards recent publications it is useful just to examine the top ten most cited books published before 1950, which I list in Table 2. As in the top 50 economics dominates over other disciplines, with six of the top seven spots; in contrast there are no books published in anthropology, geography, linguistics, management, or political science before 1950 with more than 20,000 citations. * Books originally published in a foreign language are listed twice, with the English-language edition listed second. It is useful to compare the list in Table 1 to a list of the top 10 most cited methodology books, which can be found in Table 3. As expected, the numbers of citations are incredibly high, such that merging Tables 1 and 3 would result in methodology books taking up half of the top 10. Another point to note here is the much better representation of female authors in Table 3, where three books have at least one female co-author and one, Using Multivariate Analysis (1989), is authored by two women. In contrast the highest non-methodology ranked book authored or co-authored by a woman is Stress, Appraisal and Coping (1989) by Richard Lazarus and Susan Folkman at #19, followed by Judith Butler’s Gender Trouble at #27. Finally, I examine in Table 4 the top 10 most cited journal articles, excluding methodological articles. (If such articles were included they would occupy three of the top six spots, starting with E. Kaplan and P. Meier’s 1958 article “Nonparametric Estimation from Incomplete Observations” from the Journal of the American Statistical Association.) Here the list is dominated by economics and psychology, with four publications each; in contrast the top ranked article in political science is R. Axelrod and WD Hamilton’s 1981 article “The Evolution of Cooperation” in Science at #22, with no articles from anthropology, education, geography or linguistics with more than 20,000 citations. Another thing to note is the relatively low numbers compared to Table 1, where there are seventeen publications with more than 40,000 citations compared to only four journal articles. Elliott Green is Associate Professor of Development Studies in the Department of International Development at the LSE. His research on ethnic politics, decentralization and development in Sub-Saharan Africa has been published recently in such journals as Comparative Politics, Economic Development and Cultural Change and International Studies Quarterly, among others. Karl Marx’s PhD was in philosophy and Das Kapital is standard in sociology coursework (social theory) and is also often included in political science, political philosophy, and history. So why the choice to define it as Economics? Agree, I’d also say it is sociology. I agree that classifying Marx is very difficult – he could classify as an economist, sociologist, philosopher and even political scientist. I listed Das Kapital here as a work in economics largely because of its subject matter. It is not hard to know what Marx did. Actually is pretty easy. Just try to find the word “sociology” is his work and you´ll have the answer. For me, as a professor of Epistemology of the anthropological sciences, Marx should not be part of classical sociological theory. “Classical sociological theory” is thought which has significantly shaped the discipline. It is defined by its impact on the work of generations of sociologists. The term “sociology” is of little importance in itself. Indeed Durkheim only chose to call himself a sociologist rather than an anthropologist because he did not wish to be associated with the racist connotations of the latter. Thank you. Just shows how quality wins over quantity, every time. A really interesting graph. A quick question, and my apologies if I’m being dense. Why is Rawls’ Theory of Justice listed under philosophy rather than under political science? I’d love to see an edited collection of something like the most important or influential papers in the various fields of social science. Not sure Baron & Kenny can be considered as not methodological? I believe it’s a methodological article. It is a methodological article no question about it! Baron & Kenny (1986) is indeed a methodological paper. John Rawls is a philosopher, not a political scientist. Aidnography: see the first link above – the increased focus on citations as a measure of academic productivity means that understanding who gets cited is an important task. The fact that so many of the top scholars listed above are white European/American men is itself both noteworthy and troubling. Why does a graphic from New Zealand appear to arrange all the degrees into a map of Australia? This is a tough call – I decided to list Porter’s work as economics as he has a PhD in business economics and lists “economic development” as one of his research areas on Google Scholar. An interesting and very useful article indeed. Table 4 confuses Oliver Williamson’s 1975 book Markets and Hierarchies and his 1973 article by that name, which, according to Google Scholar, has roughly 1500 citations. If classified correctly, the book would presumably be in the top 50 list. Thanks for your comment; that is indeed a mistake. What happened is that the link on Google Scholar for Markets and Hierarchies yields a reprint of the AER article rather than the book, which is why I listed it as an article. If it were listed on the main book list it would be 33rd. Hi Alberto – thanks for this; it’s very interesting. I did indeed include different editions of the same work, since Google already accumulates various editions automatically. As regards translations, I deliberately only included English-language editions plus original language editions for those books not first published in English. Including all translations would be very difficult for author without a Google Scholar page, such as Imagined Communities, which has been translated into various languages oftentimes with a title which is not an exact translation of its original title (cf. Die Erfindung der Nation in German, which is literally The Invention of the Nation). I am a teacher from the Open University of China. I have read your blog about the most-cited publications in the social sciences. It’s very interesting. As My major is Pedagogic, I want to use your methods to find the most-cited publications in Pedagogic according to Google Scholar. Could you be kindly enough to share your methods in find the most-cited publications in the social sciences, especially how to download cited documents data. Hi Alberto and Elliott. Just want to clarify that Nature’s feature of the ‘top 100’ cited items was ranked based on Web of Science data. I was one of the reporters working on it: I asked Google Scholar to create us a list too, for interest, and we published it as a side-box, but we didn’t focus on it heavily or try to clean it up. Alberto made clear that Google Scholar’s methods to create this list were far from satisfactory. I’m really interested to see these rankings! Richard. Hello Richard. Yes, we were aware that your main focus was to highlight the most cited documents in the Web of Science as a way to celebrate the 50th anniversary of the Science Citation Index. Our intention was only to bring attention to the problems of the data available in your alternative Google Scholar ranking, because we had been analysing a very similar dataset shortly before, and had noticed these problems. One step further would be to find out which quotes from these classic books most often appear in others. It would give a very nice overview of these books. I would expect the same kind of distribution (one citation amounting as much as all others combined). A proper set up would then allow to link forward from the classic ‘tree’ to his commenting ‘branches’ (much better than a human editor/annotator in any case). I wonder if Google Scholar already provides this kind of data. I wonder whether Marx’s citation number also includes the Chinese journals. As a nationally adopted doctrine for so many years, his name has been cited in the majority of the journal articles, newspaper articles, government documents of that period. Given the population in China, only counting the Chinese text should be able to put him way above any academic writer. The English counts may even just be a fraction. I think this research only works in the context of free societies where people are free to decide what ideas to discuss, disseminate, study, and promote politically. Please read carefully before giving your comment. Interesting analysis. I’m curious why you chose to include philosophy on your list of social sciences, when it’s typically considered one of the humanities disciplines, and why you chose to exclude history (but not historians themselves, such as Foucault, Kuhn, Anderson, and a few others), literary and cultural theory, and other fields that tend to use more social-scientific methods than philosophy does. It’s interesting to compare my lists of most commonly cited *humanities* authors: see here and here. Citation comparisons across disciplines are highly misleading–you are comparing apples and oranges. As anyone who has served on cross-disciplinary evaluation panels quickly learns (or should), citation styles vary enormously even across subfields within disciplines. For example, all other things being equal, so-called “book fields” will yield fewer citations than “article fields” since the rates both of original publication and of subsequent citation (viz. in other books) are much lower for books (which can take years to produce) than articles (which can take months). Fields in which the norm is a dozen 5 page articles with hundreds of references and multiple authors will automatically yield higher citation rates than those in which the norm is 2 or 3 single author articles of 30 pages each. I find your piece very interesting and thought provoking Elliott. I would be interested to see a chart relating to the publication date for journal articles too along the lines of that you have produced for books. Are you able to add this? Also curious why History not included — no books with great impact? I realize I’m a year late to this post but in case anyone is still listening, I was wondering how Donald Schon’s book The Reflective Practitioner did not make it onto this list. It currently has over 52k citations on Google Scholar. Schon had a phd in philosophy and my general sense is that sociology, management and education are the disciplines that most frequently cite his work. Why was Baron and Kenny not considered a methodological paper?